Advanced Network Configurator is a reliable program that allows you to create a series of network profiles, with different IP settings, which can be associated with your network card. the software is easy to use and allows you to ping the IP address as well as to trace and diagnose the route. Advanced Network Configurator allows you to easily create new network profiles on the same network card, with different IP settings. All the profiles are be saved in the program’s dashboard and can easily be activated, with the click of a single button. 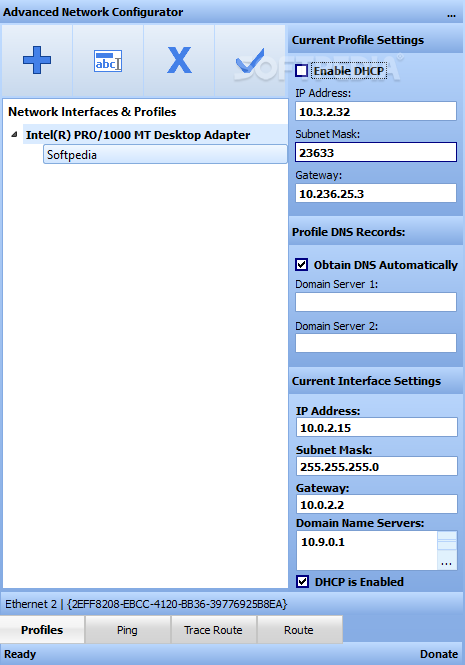 Generally, new network profiles or IP settings can be made from Control Panel, in the Network and Sharing Center. Instead, you can access and modify each network profile from the main window of Advanced Network Configurator. The software runs in the background and maintains an icon in the system tray, so you can quickly restore its interface. Creating a new network profile can be made in a few quick steps. You can easily add a new profile name, then configure the settings from the column on the right. You need to specify the IP address, subnet mask and the gateway or you may enable the Dynamic Host Configuration Protocol and let the software configure the required parameters. Similarly, you can specify one or two domain servers or set the application to automatically acquire the domain name system (DNS). The current interface settings are also displayed, at the bottom of the column. Advanced Network Configurator allows you to ping a remote host, trace route and view the routing table configuration. Advanced Network Configurator allows you to create new network profiles and change your IP address via a dedicated function, directly retrieving the WIN32 API. It is also suitable for keeping up to speed with the configuration parameters when you set the local IP devices which are separated from the Intranet.